When the temperature outside is hot, you depend on the air conditioning system in your vehicle to keep you cool and comfortable. Like any other vehicle component, this system can manifest problems, and it may periodically require maintenance and repairs. Exploring a few of the most common issues associated with vehicle air conditioning systems could be useful. 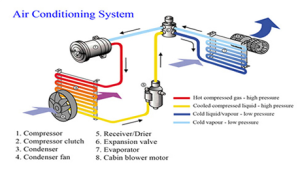 The refrigerant in the air conditioning system is a major component. If the refrigerant level is low, the system won’t emit air that is as cool as it should be. The system is sealed to prevent leaks, so if you begin to notice that the air isn’t as cool as it has been in the past, you likely need to take your vehicle to a mechanic. You can even contact a Phoenix mobile auto repair specialist to take a look at it. A mechanic will replace the refrigerant as needed. In some cases, a mechanic may need to clean the entire system before adding refrigerant. The condenser cools the vapors that go out of the compressor. This part can become dirty over time, and enough accumulated grime and dirt can cause it to become blocked. Once this happens, you’ll notice that the air conditioning system ceases to cool the air in your car. 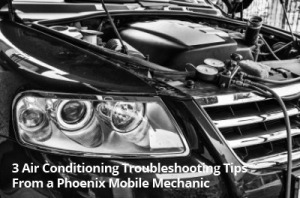 A professional who implements mobile car repair in Phoenix could flush your condenser. In some cases, condensers that are worn may need to be replaced. You may not know that your vehicle has a cabin air filter, but if it does, this component will work to filter out various particles so that you don’t inhale them. When this part is clogged with grime, you’ll experience low airflow coming from your air conditioning system. When you request a mobile mechanic repair in Phoenix 85048, you can get your cabin air filter replaced in a short amount of time. Dealing with auto air conditioner problems does not need to be a frustrating or stressful experience. When you contact American Discount Auto, you may be confident that a professional will identify and correct the problem for you. You’ll get fast, quality service at prices you’ll appreciate. One of the main benefits of contacting American Discount Auto is that the visit involves no travel time for you. A professional can meet you within 30 minutes to efficiently deal with your automotive problem.